It’s probably safe to say that most of us are completely unaware of the fact that today is Alzheimer’s Awareness Day. Don’t feel bad; I wouldn’t have either if it were not for Facebook. Alzheimer’s affects old people and as young people, Alzheimer’s doesn’t give us much pause as say cancer or depression (two things that we are more likely to get diagnosed with) unless you have an older family member that has been diagnosed with Alzheimer’s or a grandparent has passed away due to Alzheimer’s. I had little knowledge of what Alzheimer’s was or cared to know, until my mom was diagnosed with Alzheimer’s at 56, when I was 17. As a 17 year old, hearing that my mom had Alzheimer’s, was a shock. I had no idea what that meant. The only thing I did know was that it was bad. That it had no cure. Now, being 22, I have a better idea of what Alzheimer’s is, by watching my mom go through it. At first, there really wasn’t a whole lot of change. She had some short-term memory issues, but other than that, she was pretty much the same. She obviously had to resign from her job, the chair of the OB/GYN and Reproductive Endocrinology Department at the Medical College of Georgia (she’s a smart cookie). To me though, she was still, for the most part, my mom. As time went on, other things started to slip too. Things that she always knew how to do became hard. Like driving. We had to hide the keys from her so she wouldn’t try to get in the car and drive off. One day she did, but that’s a different story for a different time! Being a doctor, she was incredibly smart, so as her Alzheimer’s progressed, she started to forget things she always knew. That was really hard for her and incredibly frightening. The thing she held onto the tightest (her intellect) was uncontrollably slipping away from her. As her daughter, watching her slip away was really hard. She increasingly became less and less of the mom that I always knew her to be. As the disease kept growing, she became paranoid and mean. The mom that I always knew and depended on was slipping away and there was nothing I could do. It was as if she was drifting off into the nothingness of space and all I could do was watch and say goodbye to the woman I loved and knew as Mama. On a very real and physical level, neither my mom nor me had control over this disease. And I hated that. I hated not being able to do anything to help her or quiet the growing sadness and anger and anxiety that were welling up inside me. Not only did she and I not have control, no one else did because there was no cure. In moments like this, where the anxiety is unbearable and our own smallness is frightening and crushing, we are tempted to lose all hope. And for a while I did. I lost all sight of God’s sovereignty. But God, in His loving kindness and sovereignty, had something else in mind. By having me watch and experience my mom drift helplessly into unawareness, God painted a stark picture of the control I don’t have and consequently, the power I don’t have over my own spiritual state. In and of myself, I don’t have the power to save myself. I don’t have the power to choose and consequently stay faithful to God. Like my mom, we as humans are in a state of spiritual Alzheimer’s. We just don’t know God. We can’t because we are dead in our sins (Ephesians 2:1). My mom can’t fix her Alzheimer’s. We can’t fix our spiritual Alzheimer’s. Our state is even worse than my mom’s because not only do we forget God, we actively fight and sin against Him (Ephesians 2:1-3). Because of my mom’s Alzheimer’s, I became very aware of the fact that I have zero control over physical things and spiritual things, like my standing with God. If it were up to me, I would be dead in my transgressions with no cure. 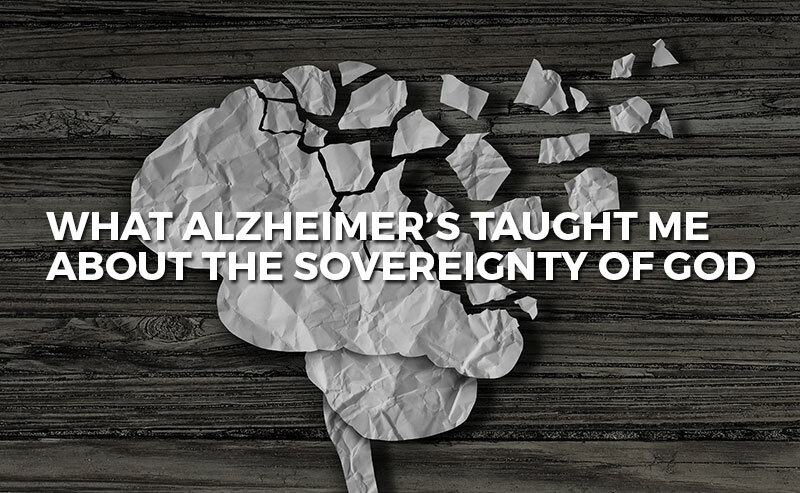 Because there is no cure, that’s where the story of Alzheimer’s ends, for now. For people, like my mom, who are diagnosed with Alzheimer’s, the ending of their story is bleak. You drift away into unawareness. It may take 15 years or 5 years, but the ending is the same. Thankfully, the state of our soul doesn’t end there. There is a cure for our spiritual forgetfulness and deadness and His name is Jesus. God in His loving kindness pulled us out of our spiritual Alzheimer’s, raised us from the dead (as a consequence of our sin) and saved us. He gave us a cure. Himself. He is the One who made a way for us to be reconciled to Him through the life, death, and resurrection of His Son, on our behalf. Apart from Him, we are spiritually dead, floating away from life and into the depths of His wrath. God saw us in our sin and because of nothing other than His grace, He saved us. That’s what Paul is saying. Praise be to God that He is sovereign over our salvation because in and of ourselves we have no control, just like my mom. Trust in His sovereignty! See it as good. Even though Alzheimer’s has no cure, we can still praise God because He has given us the ultimate cure for our spiritual deadness. Himself in Christ Jesus.